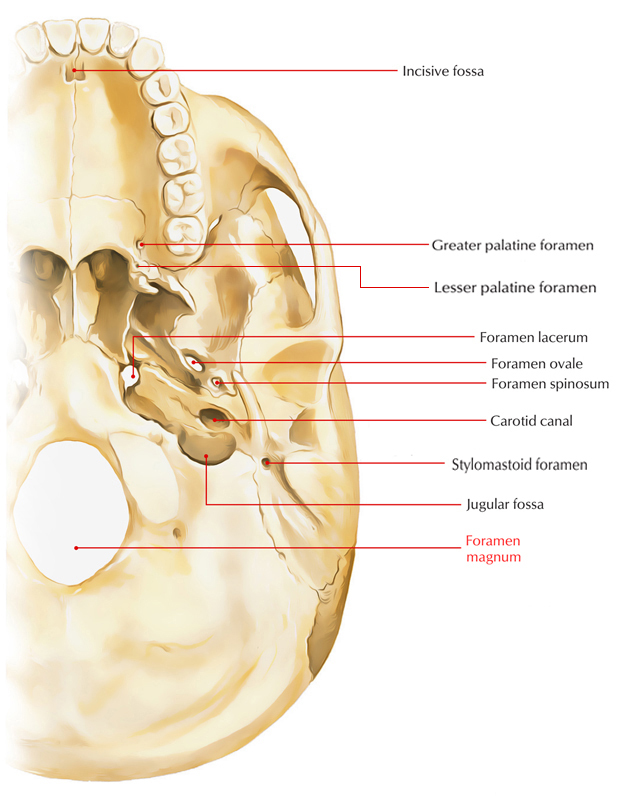 Foramen Magnum is the largest foramen within the skull and centrally, in the deepest portion of the posterior cranial fossa. It is surrounded anteriorly by the basilar part of the occipital bone, the lateral parts of the occipital bone on both side, and posteriorly by squamous part of the occipital bone. The spinal cord travels superiorly via the foramen magnum in order to proceed as the brainstem. The vertebral arteries, the meninges, as well as the spinal roots of the accessory nerve [XI], also travel via the foramen magnum. Upper longitudinal band – the cruciform ligament of atlas. Membrana tectoria, which is an extension of the posterior longitudinal ligament of the vertebral bodies. Medulla oblongata along with its meninges that includes dura mater, arachnoid mater, along with pia mater. Right and left posterior spinal arteries. Interacting veins among the internal vertebral venous plexus and the basilar venous plexus. Two, right and left vertebral arteries. Sympathetic plexus around the vertebral arteries containing postganglionic sympathetic fibres originated from the inferior cervical sympathetic ganglion. Right and left spinal roots of two accessory nerves.